...Diamonds? Nope! My best friend is most definitely the dishwasher! And I didn't know just how much of my best friend it was until today, when it broke down. So, I had to reacquaint myself with the rubber gloves and the tea-towel. We hadn't spent any time together for a long time, not that I'd missed them in the slightest! It's funny how we take things for granted. We just don't realise it until it's gone. 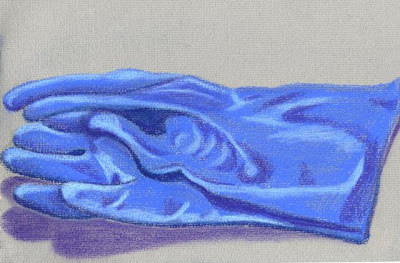 I sketched the rubber gloves earlier on today, they took about 15 minutes to do, with these lovely soft pastels. 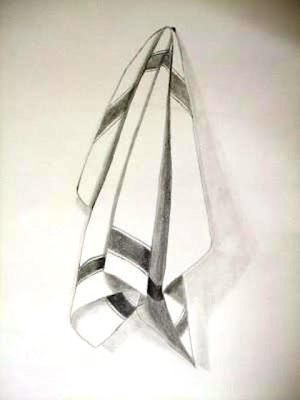 The Tea-Towel is a pencil drawing I did a VERY long time ago, which I came across the other day!